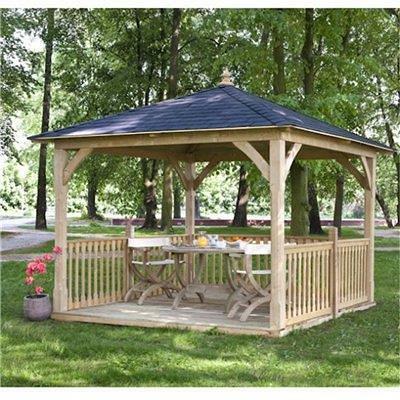 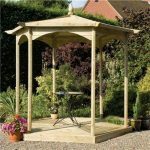 This Gazebo is a cottage style and has been made from Spruce wood and with a shingle roof and surrounding wooden fence. 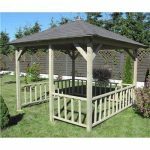 It is full of elegance and beauty well-suited to any garden and an attractive focal point. 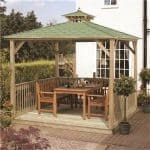 Large enough to house an outdoor dining table and chairs you could use this for alfresco dining or just to relax with a good book. 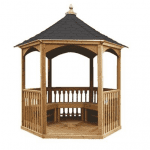 Whatever your choice, this Gazebo will give you pleasure for many years. This particular one comes complete with Venetian panels.